According to a recent survey by Harris Interactive, the percentage of physicians who used handheld personal digital assistant (PDA) devices increased from 15 percent in 1999 to 26 percent in 2001. The survey predicted that given the current rate of growth, about half of all doctors will be using handheld devices by 2004 or 2005. How do neurologists compare? In an earlier report by Cyber Dialogue, conducted in the summer of 2000, 21 percent of all neurologists claimed to have a PDA compared with 19 percent of physicians overall. Neurologists are using PDAs to access reference sources, prescribe medications, communicate with colleagues, improve coding, capture charges for billing, and track patient information. Handheld devices are helping us keep up with the latest information in our field. By providing valuable tools at the point of care, they enhance medical decision-making and help us practice more efficiently. 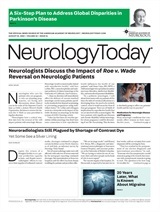 For this article, neurologists spoke to Neurology Today about how they are using PDAs to streamline their practices. George Morris, MD, for example, an epileptologist at the Regional Epilepsy Program at St. Luke's Hospital in Milwaukee, is presently beta testing a PDA, which substitutes for the laptop he had previously used for programming vagus nerve stimulators (VNS). He calls the transformation “miraculous.” Settings on his handheld are selected to send information to a programming wand, which generates a radiofrequency signal to a device that applies intermittent signals to the left vagus nerve. Dr. Morris says that, due to its compactness, “the handheld is an obviously excellent choice compared with the much heavier, more cumbersome laptop.” It also programs the VNS faster (has no moving parts and requires no boot-up), provides much longer battery life (eight hours continuous use), and has a very large storage capacity (32 megabytes). Unlike most physicians, who are initially drawn to a PDA for its non-medical uses, Dr. Morris began to use a handheld for scheduling and other routine features only after experiencing the appeal of this novel medical application. Prescription writing is one of the most helpful applications transformed for digital tools. In fact, the follow-up report from the Institute of Medicine trial on medical errors, which was released last March, recommended a greater use of information technology; automated medication order entry systems that can reduce errors in prescribing and dosing drugs; and computerized reminders that can help both patients and clinicians identify needed services. For Joel Vandersluis, MD, a neurologist who practices in Dayton, producing legible, error-free prescriptions has been a wonderful solution for his poor handwriting. He uses a handheld device to select medications and dosages and beams the information to his printer. Refills are done with a few simple clicks, saving him and his office staff time and effort. David A. Stein, MD, a neurologist with a solo practice in San Diego, has also benefited from this new technology. He has been using an electronic program to write prescriptions for the past two years. He believes it is safer than the hand-written form due to improved legibility and ease in tracking patient medication records. The system used by Dr. Stein offers a comprehensive drug reference database and a drug-drug interaction tool, integrated to provide greater prescribing accuracy. It then sends signed prescriptions to the pharmacy through a secure Internet connection. How else can these devices help neurologists improve medical practice? Neil A. Busis, MD, has been using a PDA for patient care in his neurological practice for the past year. Dr. Busis has formed a PDA users group at the University of Pittsburgh, which is developing handheld-friendly clinical guidelines that will be made available to medical staff and residents. He plans to conduct a clinical research study to determine if these guidelines are followed more often as a result of being present at the point of care on physicians' PDAs. If so, they will be able to demonstrate an application of handhelds that increases the quality of medical care. Dr. Busis said that, among many uses, neurologists can use handheld devices to download and access programs that enhance clinical decision-making. Dr. Busis hopes that more programs become available that include physician orders and alerts and reminders tied in to a particular patient. He observed that handheld technology is presently limited by screen size, memory capacity, and security issues. He would like to see more programs which serve as interactive tools that take neurologists through the clinical steps needed to reach a diagnosis at the point of care. Currently, there are few neurology reference products available for handhelds. Adams: Principles of Neurology is obtainable in a companion handbook version, which summarizes clinical portions of the parent textbook. The Massachusetts General Hospital (MGH) Handbook of Neurology has also been adapted to a PDA downloadable form and is being used by its affiliated medical students, housestaff, and attending physicians. The handheld version, which is being released for commercial use early this year, includes decision-making algorithms, protocols, step-by-step tests, and procedures. Alice Flaherty, MD, a hospital-based attending neurologist at the MGH, began to gather this material while still a resident. To write the handbook, she consolidated her extensive lists of practical information into text covering basic neuroanatomy, clinical neurology, radiology, neurosurgery, and relevant general medicine. The book is organized in a hierarchical form in terms of disease pathogenesis and treatment. The outline format, with its highlights of key points and bulleted summaries, served as an ideal style to transform into software for a palm device. A resident using a PDA may easily look up information such as how to determine the age of hemorrhage on MRI, find guidelines for implementation of a subarachnoid protocol, or retrieve descriptions of different types of aphasias. Dr. Flaherty finds her PDA discreet as well as indispensable. Residents, who admitted they had been too embarrassed to look up things in front of others in the past, are comfortable quietly referencing their handhelds. Similarly, while quizzing housestaff on rounds, she is able to look up the details of obscure neurological subjects inconspicuously. Like Dr. Busis, she often refers to ePocrates to look up medications and drug-drug interactions. She uses it in rapid sequence together with the MGH Handbook to retrieve medical information at the bedside. She feels its small size makes it relatively unobtrusive when evaluating patients. She also values her PDA for its portability; if paged for an emergency while out to dinner, she is able to access pertinent medical and neurological information quickly. How are PDAs being used by your colleagues in emergent situations? Next month's In Practice column will provide more information on this subject. ♦ Mark R. Nuwer, MD, PhD, will lead a full-day course, “The Practice of Neurology: Issues in Coding and Reimbursement,” which will cover guidelines and rules for accurately coding diagnoses, neurodiagnostic procedures, and documentation standards. In addition, budgeting, planning, and government regulations will be covered. Saturday, April 13. ♦ Garry M. Franklin, MD, is the Director of the half-day course, “Using AAN Guidelines and Best Current Evidence in Daily Practice,” to help neurologists evaluate the types of evidence used in developing AAN practice guidelines, and translate that evidence into best practice. Saturday, April 13. ♦ Dr. Neil Busis will be leading a luncheon seminar entitled “Purple Gloves and PDAs: Electronic Aids in Medical Decision-Making.” Participants will learn about electronic aids to medical decision-making that can be accessed at the point of care to improve clinical outcomes, increase patient satisfaction, and reduce medical errors and costs. Tuesday, April 16. ♦ Dr. Nuwer will also present a luncheon seminar, “Coding Evaluation and Management (E&M),” which will review current Medicare guidelines for coding E&M services and provide examples of coding for typical neurology visists. Thursday, April 18. ♦ Drug databases through ePocrates at www.epocrates.com.